Place this night stand next to your bed for a functional and stylish addition to your bedroom. 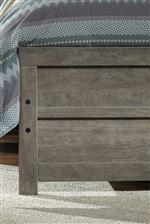 Finished in a warm gray vintage color with a faintly distressed effect, this piece features two drawers for all the belongings you need close by while you relax in bed after a long day. Slim USB ports are located on the back of the night stand for charging your phone, tablet or other device. The Culverbach Contemporary Two Drawer Night Stand with USB Ports by Signature Design by Ashley at Casa Leaders Inc. in the Wilmington, Long Beach, Torrance, Lakewood, Los Angeles area. Product availability may vary. Contact us for the most current availability on this product. The Culverbach collection is a great option if you are looking for Rustic Contemporary furniture in the Wilmington, Long Beach, Torrance, Lakewood, Los Angeles area. Browse other items in the Culverbach collection from Casa Leaders Inc. in the Wilmington, Long Beach, Torrance, Lakewood, Los Angeles area.